This post will explain 7 keyboard shortcuts for the filter drop down menus. This includes my new favorite shortcut, and it's one that I think you will really like! This post will explain 7 keyboard shortcuts for the filter drop-down menus. This includes my new favorite shortcut, and it's one that I think you will really like! 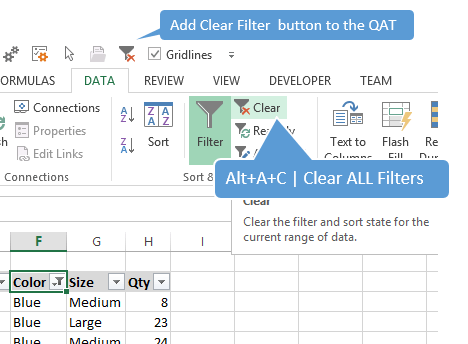 The Filter drop-down menus (formerly known as Auto Filters in Excel 2003) are an extremely useful tool for sorting and filtering your data. When the Filters are applied you will see small drop-down icon images in the header (top) row of your data range. These menus can be accessed with keyboard shortcuts, which makes it really fast to apply filters and sorting to different columns in your table. So let's take a look at these shortcuts. Ctrl+Shift+L is the keyboard shortcut to turn the filters on/off. You can see this shortcut by going to the Data tab on the Ribbon and hovering over the Filter button with the mouse. The screen tip will appear below the button and it displays the keyboard shortcut in the top line. This works with a lot of buttons in the ribbon and is a great way to learn keyboard shortcuts. See the image below. To apply the drop down filters you will first need to select a cell in your data range. If your data range contains any blank columns or rows then it is best to select the entire range of cells. Once the data cell(s) are selected, press Ctrl+Shift+L to apply the filters. The drop down filter menus should appear in the header row of your data, as shown in the image below. Select a cell in the header row. The cell must contain the filter drop down icon. Press and hold the Alt key, then press the Down Arrow key on the keyboard to open the filter menu. Once the drop down menu is open, there are a lot of keyboard shortcuts that apply to this menu. These shortcuts are explained next. 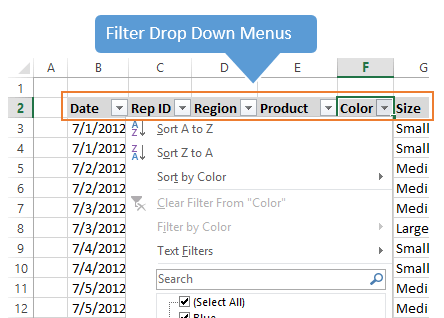 Bonus Tip: If you are using Excel Tables, and I highly recommend you do, you can press Shift+Alt+ Down Arrow from any cell inside the table to open the filter drop-down menu for that column. This shortcut was introduced in Excel 2010 for Windows, and works in all newer versions as well. The up and down arrow keys will move through the items in the drop down menu. You can press the Enter key to perform that action. This requires the drop down menu to be open by first pressing Alt+Down Arrow. See the image in #3 above for details. 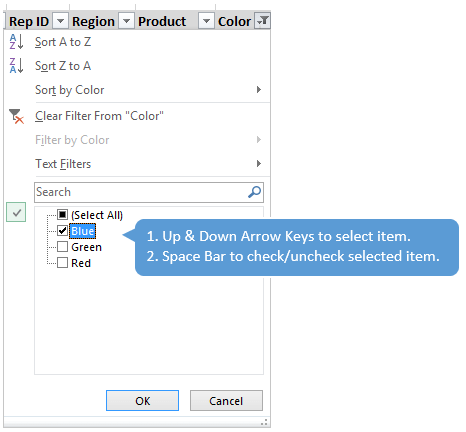 Starting in Excel 2007, a list of unique items appears at the bottom of the filter drop down menu with check boxes next to each item. You can use the up/down arrow keys to select these items in the list. When an item is selected, pressing the space bar will check/uncheck the check box. Then press Enter to apply the filter. 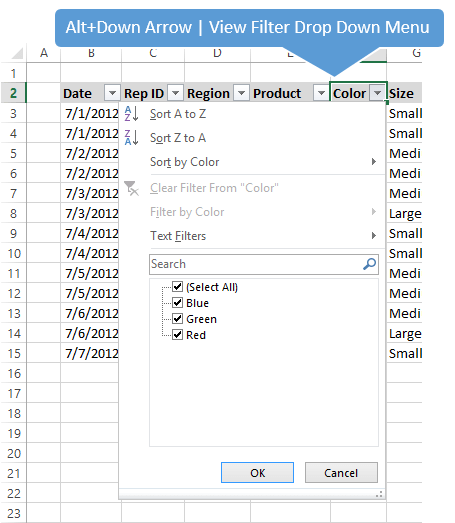 Starting in Excel 2010 a Search box was added to the filter drop-down menu. Excel 2011 for Mac users also get this feature. This search box allows you to type a search and narrow down the results of the filter items in the list below it. When the filter drop down menu is open, you can press the letter “E” on the keyboard to jump to the search box. This places the cursor in the search box and you can begin typing your search. Alt+Down+Arrow+E is the shortcut to open the filter drop down menu and jump directly to the search box. I just learned this shortcut and it is my new favorite because it makes it so fast to type and filter exactly what you are looking for in the list. Prior to learning this I was using the down arrow key to get to the search box. This required me to press the down arrow key 7 times to get to the search box. Now I can do the same thing in one step by pressing the letter “E”. What a time saver! If you want to jump down to the checkbox list below the Search box, you can just press Tab after Alt+Down Arrow, E.
You can use either the Down Arrow or Tab keys. Down Arrow will probably be easier since you just pressed Down Arrow to open the filter menu. However, if the column contains dates then you need to press Tab twice. There is an additional drop-down menu to search by Year, Month, Date. Down Arrow opens that menu and selects each item. Therefore, it's probably best to get used to using Tab to get there since it works in all situations. Once you press the shortcut, focus will be set to the (Select All) checkbox in the list box. You can then use the following shortcuts to navigate and select the checkboxes. Up/Down Arrows to select items. End jumps to last item. Home jumps to first item. Page Up/Down to jump to first/last item in view. 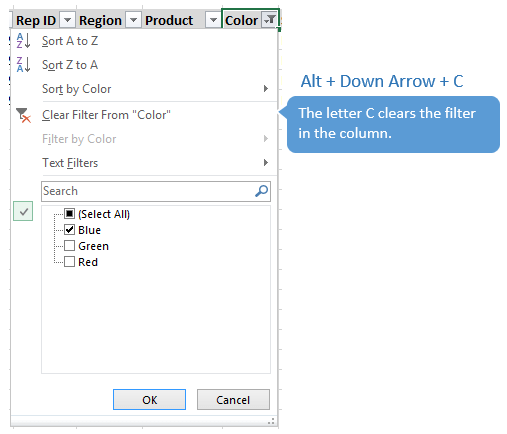 Alt+Down Arrow+C will clear the filters in the selected column. Again, this is a combination of the Alt+Down Arrow to open the filter menu, then the letter “C” to clear the filter. This would be the same as pressing the (Select All) checkbox in the item list. The next shortcut will explain how to clear all the filters in all columns. Alt+A+C is the keyboard shortcut to clear all the filters in the current filtered range. This means that all the filters in all the columns will be cleared, and all rows of your data will be displayed. I add the Clear Filter button to the Quick Access Toolbar (QAT) and would highly recommend that you do this. It serves two purposes that are very helpful. You can quickly press the button in the QAT to clear the filters. If you are a mouse user this means you don't have to navigate to the Data menu to access the button. You can also use keyboard shortcuts to press the buttons in the QAT. See my articles on how to setup the Quick Access Toolbar and how to use the QAT's keyboard shortcuts for instructions on this. Use the button to visually see if any filters are applied. This is the most important benefit to me. If any filters are applied to the filter range, then the Clear Filter button in the QAT will show color (enabled). If no filters are applied then the button is grayed out (disabled). See the image below for details. 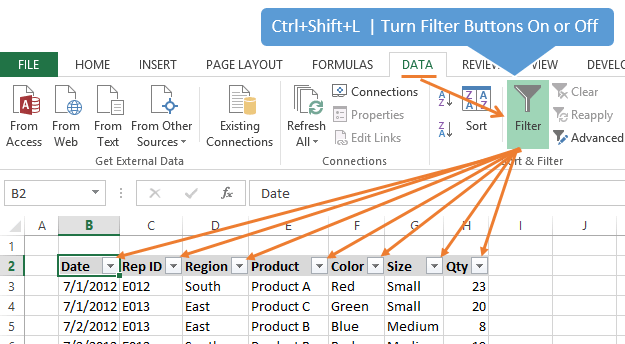 Debra Dalgleish has a great post and video with a few additional tips to Clear Excel Fitlers with a Single Click over at the Contextures blog. 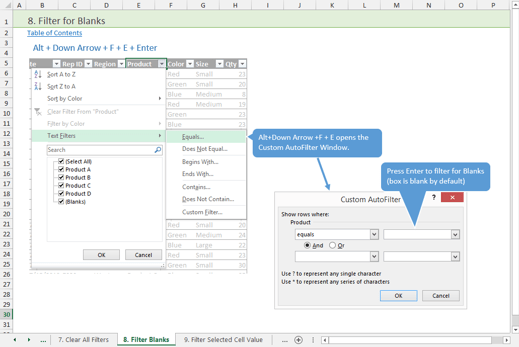 Alt+Down Arrow+F+E+Enter will filter for blanks cells in the column. The F,E combo opens the Custom AutoFilter menu where you can type a search term. The box is blank by default. So if you just hit Enter when the Custom AutoFilter menu opens, the column will be filtered for blanks. This is another one of my new favorites! It's much faster than unchecking the Select All box, then scrolling to the bottom of the item list. You can also filter for Non-blanks using the shortcut Alt+Down Arrow+F+N+Enter. This opens the Custom AutoFilter menu and sets the comparison operator to does not equal. The criteria is blank by default, so this applies a filter for non-blank cells. Thanks to Nilesh for leaving a comment and inspiring this one! Typically you can only have one range filtered on a sheet at a time. This means that if you have more than one range of data on a sheet, you can not apply the Filters menus to both ranges. 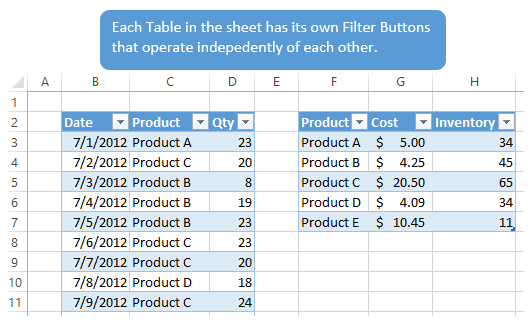 If you use the new Excel Tables feature (introduced in Excel 2007 and available for 2011 for Mac) then you can apply Filters to each table in the same worksheet. 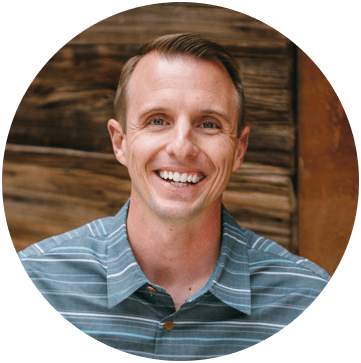 Checkout my video tutorial on Tables to learn more about all the great time saving benefits they have to offer. I hope you've learned some new tricks that will save you time when working with Filters. In my opinion, the keyboard shortcuts are the fastest way to work with these menus. I encourage you to practice these techniques, and also share them with a friend that might benefit. I have also created a free workbook that contains over 25 keyboard shortcuts for the Filter Menus. The workbook is organized by topic and contains images that will help you learn the shortcuts. It also includes a data table where you can practice the shortcuts. Please click the link above and the Excel file that contains the shortcuts will be emailed to you immediately. What does the following keyboard shortcut sequence do? The selected cell must be in the header of a filtered range. Please leave a comment below with your answer. Thanks! Its very Nice.I have a Learnt So Many Excel Shortcuts From This Excel Campus.Keep More Updating On Campus. Waiting At Excel Campus For New Updates.Once Again Thank You So Much To Excel Campus…..
Its very Nice.I have a Learnt So Many Excel Shortcuts From This Excel Campus.Keep More Updating On Campus.Iam Waiting At Excel Campus For New Updates.Once Again Thank You So Much To Excel Campus….. In the list 12 months is available and i have already selected the August in the list. When again i go to filter and drop down the filter rather going one by one in months is there any method to go directly on on selected “August” Month with out typing “Aug” alphabets. 2. Down arrow to set focus to the listbox. 3. Type a to jump to the words that start with “a”. 4. Up/Down arrow keys to highlight the item. 5. Spacebar to select or deselect. It’s not exactly what you are looking for, but might help. In filter will check-Uncheck items in this list box. next time check items in this list direct how to go..? It will select the last category of that column/ deselect the all the categories accept the last one. Indeed helpful. Thanks very much. Would be beneficial in saving time and increasing productivity/efficiency. Is it possible to do any of these functions on Excel for Mac. My biggest grime of my company is I had to move to Mac and can’t press Alt to navigate the ribbon anymore (from what I can see). please guide check uncheck shortcut key in mac because through space bar not work in mac. but i need after apply filter then check one row value one by one… using single key option…??? @Ketan: Is your “Ctrl” button in activated mode / did you accidentally hit on it? “Ctrl + Alt + Arrow” is the Keyboard combo for rotating the screen in the desired direction. Screen rotation is not the issue of office/excel…it depends which window you are using. I think in window XP only, screen rotation works not in other windows. Is there any shortcut to directly select the last selected option? Alt+Down down… until you get to the box selection and then press “End”. Is there a shortcut to jump straight to the selection menu box. Similar to alt+E but for the box below? will take you to the Select All box. You must use Excel Tables. Interestingly, your challenge question doesn’t work on date filters. I have a different problem on date filtering that brought me to your article so I thought it was interesting to see another way in which Date filtering diverges from normal filtering. Nonetheless–I do appreciate learning a new combination I hadn’t thought to use before, and it will definitely help for when I’m manually categorizing data in a new column. Thank you! FYI – Doing the above challenge combination on a date column table header gets you stuck on an extra drop-down menu for date groupings with the following options: “All”, “Year”, “Month”, “Date”. It’s actually this special “grouping” that Excel (2016) provides that has baffled me to no end on how to actually apply a *specific* date to the filter using just the keyboard. In the challange’s case, the solution is to replace with , using has the additional benefit of always working in both regular & date filter formats with the caveat that you’ll have to hit twice in date filters to place the cursor in the list of column items. The larger problem though, is that even with the column formatted as Date (IE an entry of 10/1/2014), as soon as you use a “/” in the search query, the query returns no results. A bit of playing around and I haven’t found any special kind of syntax that allows me to do this kind of filtering via typed query. It’s so frustrating! Sorry to not reply sooner. There is one workaround to this. You can turn off the date grouping feature in the filter drop-down menu. 1. This is done from the Excel Options window (File > Options). 2. Go to the Advanced tab, then scroll down to the section “Display options for this workbook”. 3. Uncheck the box “Group dates in the AutoFilter menu”. You will now see the dates in the listbox, instead of the groups. You can use the search box to search a date. 1. The setting is workbook specific, so you will have to set this up on every workbook. You can have a macro that does this automatically though. 2. You won’t be able to filter by year, month, day groups using the groups on the listbox. Here is a page from my friend Debra at Contextures with the macro to toggle the setting. Looks for spaces in the filter column. Essentially filter for ” “. I use find and replace a space ” ” with nothing “”. When I have vlookup formula that returned nothing (not #N/A but nothing) and I copy and paste values to get rid of the formulas, I need to remove these left of spaces in cells. Alt+down does not work for merged Cells. it is not working when A1,A2 B1,B2 is merged. and I want to use this shortcut It is not giving the proper list.